In Ireland's history the O Connors are so numerous, eminent and varied that an encyclopaedia would scarcely do them justice. The Dictionary of National Biography lists nineteen O Connors. It is believed that few families can trace their descent through so many generations of ancestors. Many of their pedigrees and records are stored in the Irish Genealogical Office, and in France, Spain and Austria. Although some live and die by the spelling of the name, i.e. O'Connor, Conor, Connors or O'Conner, no distinction can be made in the spelling of the name today as these spellings have been interchanged at will. The O Connors are outstanding in Irish history, highlighting its triumphs and its tragedies. O Connor - in Irish O Conchobhair or O Conchuir - comes from a personal name meaning champion. O'Connor, O'Conner or O'Conor, is perhaps the most illustrious of all Irish surnames, though this view would, no doubt, be disputed by the O'Neills, the O'Briens, the O'Donnells and one or two other great and famous septs. It is borne by six distinct septs located in different parts of the country of whom four survive in considerable numbers. The most well known sept of the name was the Royal O Conors of Connacht which eventually separated into three distinct septs: O Conor Roe, O Conor Sligo and O Conor Don. The first two have faded out. The family headed by O Conor Don remains a uniquely Gaelic family, the most eminent of all the O Connors. 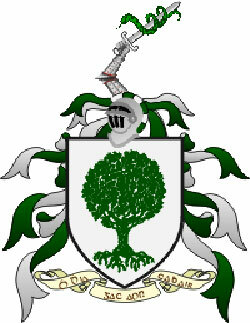 The Connacht O Conors derive their name from Conchobhar (died 971), King of Connacht. Conchobhar was of a long line of Connacht kings when kings needed to be champions to maintain their supremacy. Two high kings, who were monarchs of all Ireland, descend from him. Conchobhar had to submit to the mighty Brian Boru, King of Munster, who assumed the chief sovereignty and gave Ireland a unity she has not since known. Later the O Conors contended with neighbouring chieftains, particularly the powerful O'Rourkes. Their direct descendant, as certified by the Genealogical Office, Dublin Castle, is the present O'Conor Don and it is interesting to note that this important and aristocratic family consistently maintained its position notwithstanding the fact that they remained inflexibly Catholic. Evidence of this is abundant in all the sixteenth, seventeenth and eighteenth century manuscripts. In 1119, Turlough Mor O'Conor was High King of Ireland. He was not so much a warrior as a statesman. He tried to centralise his government, he built stone bridges and castles and had a fleet of boats on the Shannon and on the Atlantic. He maintained a mint to coin silver money. He also plundered every part of the country, as was the custom. His three marriages endowed him with twenty children. His son, Roderic, succeeded to the high kingship. His reign coincided with the invasion by the Anglo-Normans which led to the Treaty of Windsor in 1175, when Roderic (or Rory) pledged himself to recognise Henry II of England as his overlord. Kings of England now became Lords of Ireland, which meant that Rory held his kingdom of Connacht only as a vassal of English royalty. Like a number of the O Connor kings, after a life of much strife he retired to monastic seclusion in the Augustinian Abbey of Cong. In 1198 he died, the last of the Irish kings, and was buried in Clonmacnoise in County Offaly, the most celebrated of Ireland's holy places. He lies near the high altar where his father, Turlough Mor, was buried in 1156. Thus ended the royal Gaelic leadership. When Roderic abdicated, he was succeeded by his brother, Cathal Crobhdhearg (meaning of the red hand). Cathal had close contact with two kings of England, King John and King Henry III. The family archives contain letters written by him in Latin. The annals record that he died in 1224, having become a monk in one of the monasteries he had founded. Historians cannot agree as to the exact monastery, Knockmoy in Galway, or Ballintubber, which Cathal had founded in 1216. The three main branches of the O Conors of Connacht: O Conor Roe, O Conor Sligo and O Conor Don descend from Turlough. Clonalis is the family seat, near Castlerea in County Roscommon. In the seventeenth century, when the penal laws drove the majority of the Gaelic families abroad, the O Conors remained with their people and were not persuaded to revoke their Roman Catholicism. They also accumulated a treasure house of family archives, dating back to the sixth century. Clonalis was built early in the eighteenth century and it contains many portraits and relics of this great family. Despite the inability of the government to ease the financial burden, the O Conor family is striving to preserve Clonalis. It is the only house open to the public that is wholly of the old Irish, as distinct from most other families who arrived in the wake of the Anglo-Norman invasion. Not a trace remains of Belenagare, their ancient seat, from which the O Conors moved to Clonalis. Charles Owen O Conor Don (1838 - 1905) was educated at Downside in England, and was Member of Parliament for Roscommon until he was defeated by the Parnellites. He sat on many royal commissions and, in 1881, was president of the Royal Irish Academy. He wrote a family history, The O Conors of Connacht. Arthur O Connor (1765 - 1852) was of the Conner family of Manch House, Ballineen, County Cork. Arthur's elder brother, Roger O Connor (1763 - 1834), was a barrister and was also a member of the United Irishmen, which led to him serving a term of imprisonment in Fort George, Scotland. His home, Dangan Castle, burned down following a suspiciously heavy insurance cover. He eloped with a married woman. He was tried for robbing the Galway mail train and claimed that he "had but wanted to obtain from it some letters incriminating a friend". He was outrageously eccentric and took to writing imaginary annals and foolish books. The O Connor name has been remarkably prominent in painting and sculpture. James Arthur O Connor (1792 - 1841) was born in Dublin and was at first an engraver, like his father. Finding this insufficiently creative, he transferred to landscape painting, and went to London where his pictures were exhibited at the Royal Academy. They were recognised as possessing extraordinary merit, but he died a poor man. He had worked for some time in Mayo, at Westport House, seat of the Marquess of Sligo of the Browne family. Many fine O Connor paintings can be seen there. Today an Arthur O Connor painting commands a high price. As was customary with the Irish, the O Connors served in the military, administrative, medical and diplomatic services of many countries. Charles O Conor (1804 - 84), who was born in New York City, war senior counsel for Jefferson Davis in his indictment for treason. Among the many O Connor ecclesiastics were two brothers of the O Connor Kerry sept, Michael (1819 - 72) and James O Connor (1823 - 90), who were both bishops in the USA. The O Connors are leaders in Ireland's golfing community. In July 1985, at the Royal St George course in Sandwich, Christy O Connor Jr. shot a first round of 64, the record set in 1934 by the great Henry Cotton. In dealing with the landed proprietors of Connacht, among the most distinguished members of the O'Conor Don stock four O'Conors of Belnagare are outstanding in the field of culture: Charles O'Conor (1710-1791), antiquary and collector of Irish manuscripts; his two grandsons, Rev. Charles O'Conor, D.D., P.P. (1764- 1828), librarian at Stowe and author, inter alia, of Rerum Hibernicarum Seriptores Veteres, and Mathew O'Conor (1773-1844), author of History of the Irish Catholics etc; and Charles Owen O'Conor, O'Conor Don (1838-1906), President of the Royal Irish Academy and of the Society for Preserving the Irish Language and author of The O'Conors of Connacht.